Now, we’ve already established that I love to watercolor. It’s been my go-to technique for the past several months, and I think my capabilities are improving. I’ve purchased many a stamp set over the past few months specifically to use with the watercolor technique, and now I’m finding that I’m getting a bit picky with my supplies, including watercolor paper. 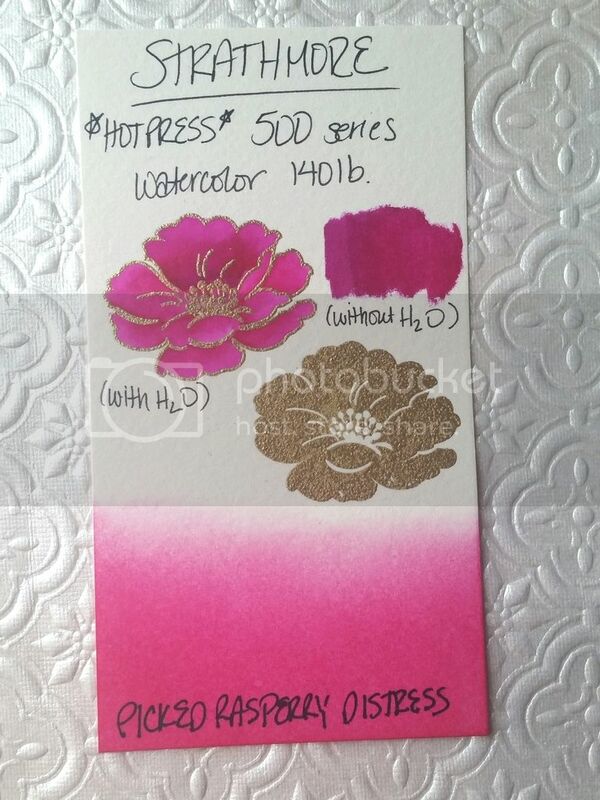 I am by no means a watercolor paper expert, but I wanted to share my findings with you. 1.) 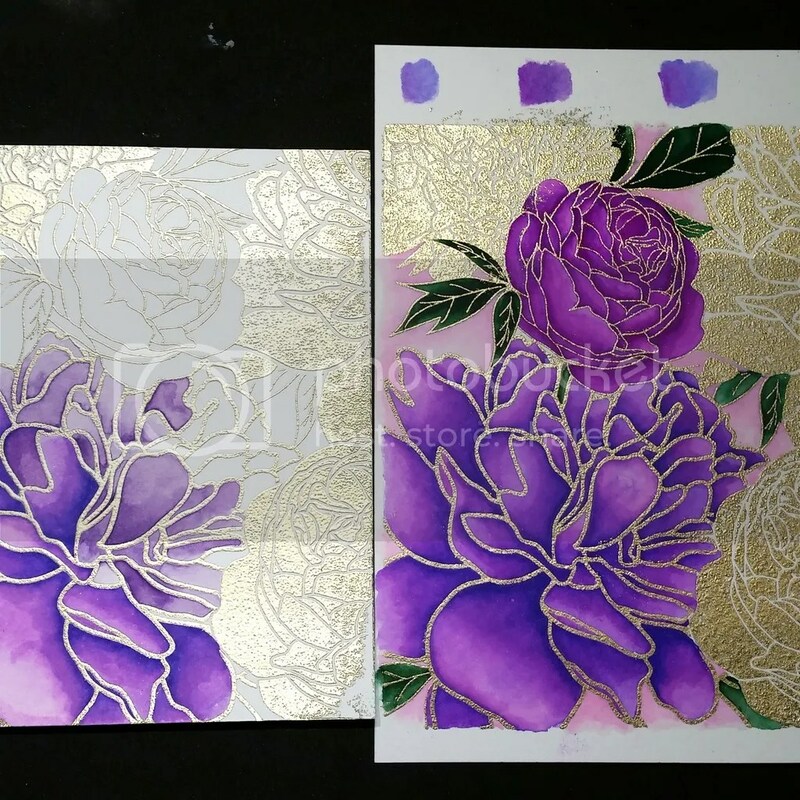 Heat Embossing: For this test, I used Ranger’s Princess Gold embossing powder, Versamark ink, and an ek success anti-static tool. (I know the photo above isn’t the best photo from a technical standpoint, but I thought it illustrated the texture or lack thereof on each of the solid embossed images) As I had previously discovered, heat embossing a solid image on the Strathmore cold-press was not an ideal method. The paper simply has too much texture, and this texture shows through the embossed image. The hot press paper is so much smoother in general, but between the two, the Fabriano seemed to give the best, smoothest, most even results. 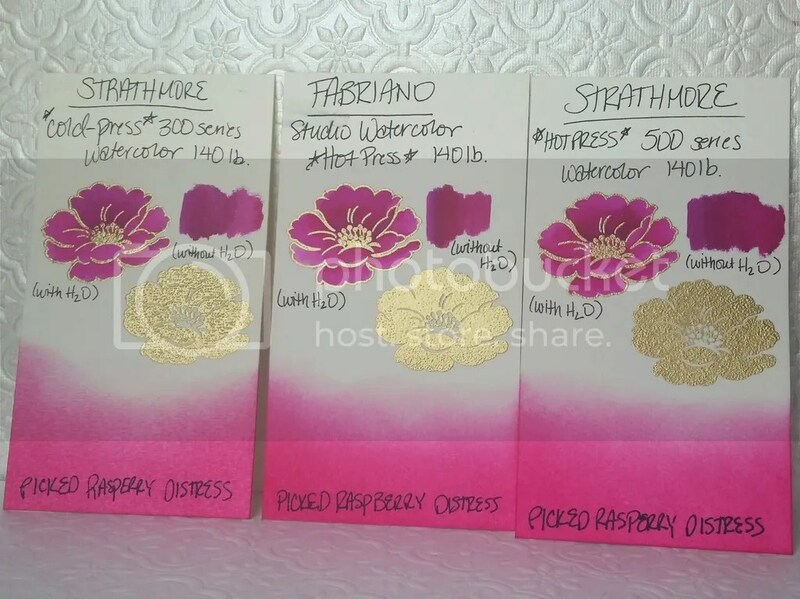 The embossing powder seemed to sink into the Strathmore hot press paper, while with the Fabriano, it seemed to lay nicely on top of the card stock and create a nice smooth finish. 2.) 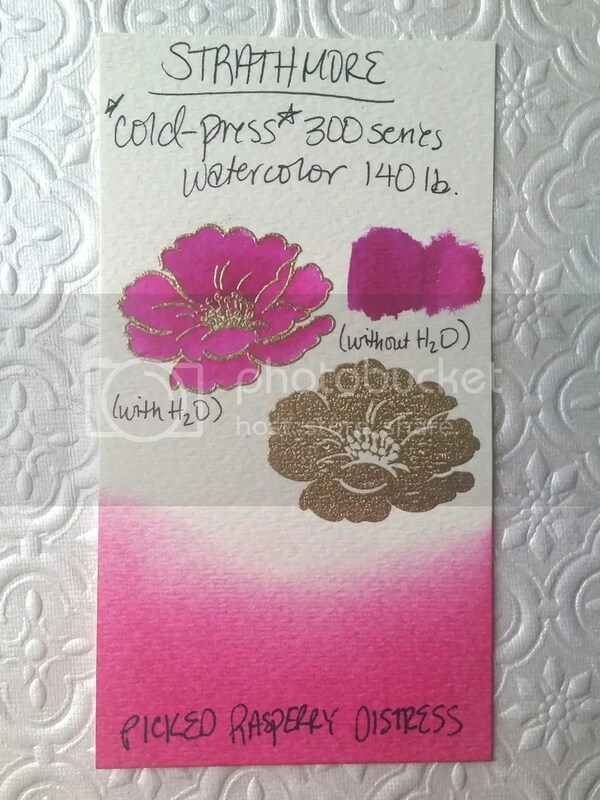 Ink Blending: For this test, I utilized my Distress Ink mini blender and Picked Raspberry Distress Ink pad. I blended the same amount of time on each, even going back after letting each of the pieces dry for a minute. I found that the Fabriano guaranteed the best saturation, followed closely by the Strathmore hot press. The Strathmore cold-press seemed to allow the ink to lay on top of the paper for quite a while without really sinking in to give that deep, saturated color like the other two papers. I had similar results today, but the original ink lines were not nearly as obvious. The ink-blending results I found with the Fabriano make sense in conjunction with the knowledge that the color doesn’t move as well after sinking into the paper. In my attempts to try to get the color to blend, the paper began to pill and warp.The Strathmore hot-press paper (on the right) had beautiful results with the Zig Clean Color markers. I’ve always had good results with the Strathmore cold-press, so I wasn’t surprised to have good results with the hot-press, as well. I found with all three papers that if I moved quickly between when I laid down the color to when I attempted to move it with my wet paintbrush, it moved much more evenly without leaving a line where the original color had been laid down. 4.) Zig Clean Color Blending (without water): To the right of the outlined flower, I did some blending with just the Zig markers without the addition of water. I laid down the purple, then immediately followed with the pink, blending the color out until it was the original pink again. The Fabriano paper left the most obvious line of where the original color had been laid down. The Strathmore hot-press seemed to take longer (or more space) to actually fade back into the original pink from the purple. 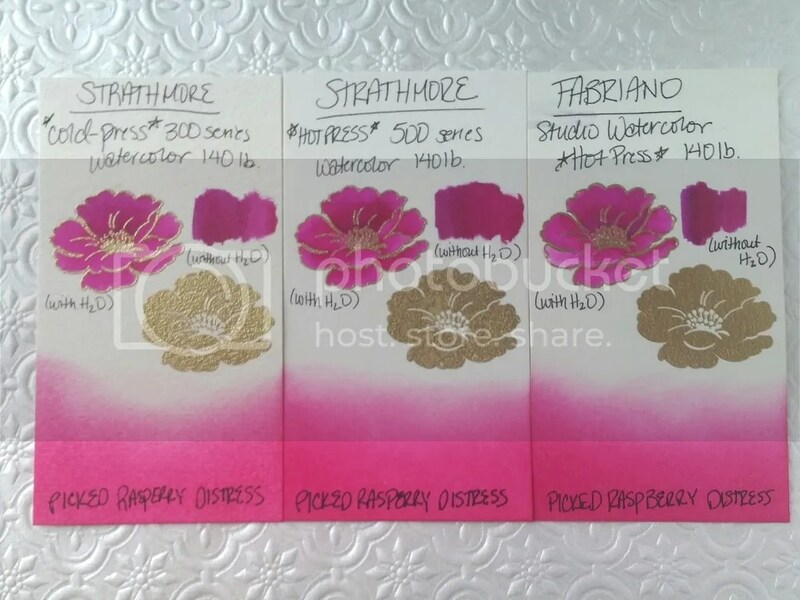 As I look at them now, after they’ve dried completely, the Strathmore hot-press has the smoothest and most subtle blend, even if it didn’t fade entirely back to the original pink. Overall thoughts: I think that, of the three, the Strathmore hot-press seemed to perform the best, overall in 2 out of 4 categories (the Zig blending, both with and without water). 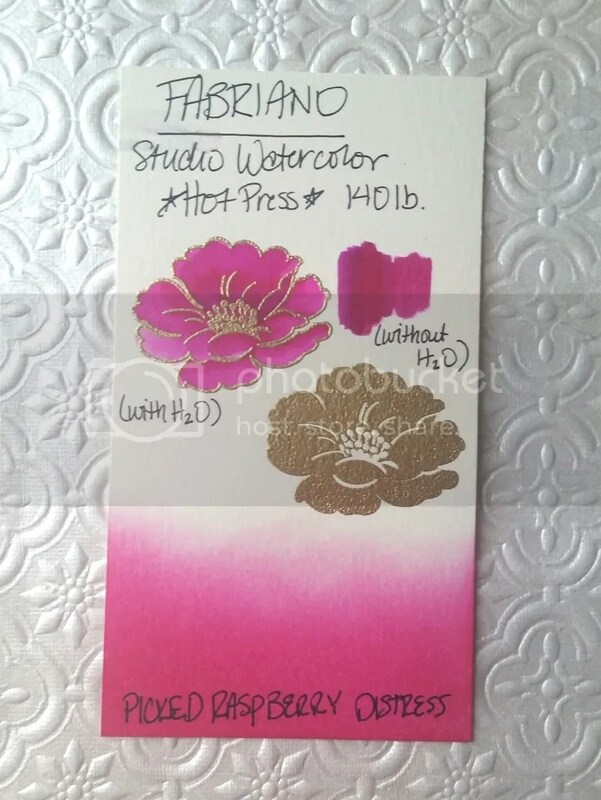 The Fabriano did the best in the remaining two categories: the Distress Ink blending and the heat embossing. If I had to recommend purchasing one, I’d probably get the Strathmore hot press, just because it performed the best, or very close to the best, in all four categories. The only category that I wasn’t totally thrilled with was the heat embossing, and that’s really because I am kind of nit-picky. (To be quite honest, I think most normal people would be satisfied with the results for all of them, but I’m a crazy person haha!!!) I’m happy to know that my purchase of the Fabriano paper wasn’t a complete waste of money, since I will be able to use it for distress ink blending with pleasure. The Strathmore cold-press does an excellent job with actual watercoloring. All three will be useful, but it will just depend on what technique with which I’m intending to use them. If you’re still with me after all of that, thank you for visiting! If you have any good results with your own experimentation and would like to share them, please feel free to leave me a comment!! I will see you back here soon with a card that I made from the purple peony panel that I peeked in the hot-press watercolor photo!